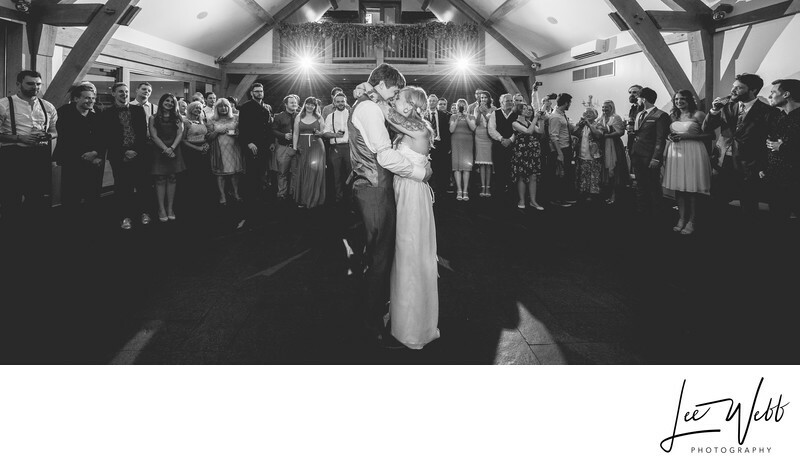 A bride and groom take their first dance after having their wedding and reception at Mythe Barn in Leicestershire. Mythe Barn is an idyllic wedding venue set deep within the Leicestershire countryside. Offering exclusive use, civil ceremonies can be held inside under stunning oak beams or outside in the fabulous gardens. There is also a large courtyard which is a beautiful location for formal photos, as well as accommodation for your wedding guests onsite. The photo you see above shows Brittany and Nick taking their first dance. This is the same room that the ceremony took place in, but after a short turnaround on is unrecognisable from the other. A lot of people came to watch the bride and groom take their first dance as husband and wife, and space was a little tight at the front, so I decided to use an ultra wide angle lens for this photo. A lot of the time I decide to focus in on the bride and groom, but there are times like this example where it's best to take a wide photo and show all of the guests too, it really helps set the scene of the wedding. In order to give this photo that extra special 'pop' I used two off camera flashes on a balcony at the back of the room. Not only does this help light the bride and groom and the guest too, but the starburst shaped flashes help frame the couple in the picture.